Russia and the United States are making moves to break the stalemate that has overshadowed relations for the last 12 months. A source in the Kremlin has confirmed that the U.S. Department of State is expecting Patrushev to arrive in Washington on May 20 to deliver a message to Obama from the Russian president. U.S. National Security Advisor, Tom Donilon, personally handed Obama’s message to Putin on April 15. Moscow’s response to the letter was demonstratively favorable. The key message of the letter is that Russia and the US must jointly respond to global challenges instead of having minor disputes. Relations between Moscow and Washington have soured over the last 12 months. There are many reasons for this – the Magnitsky Act adopted by U.S. Congress, the Russian adoption law passed in response, tighter rules for NGOs in Russia and lawsuits against Russians in the United States to name just a few. But none of these problems were mentioned in Obama’s message. The letter does, however, contain some specific proposals. President Obama also proposes the two countries "could sign a framework agreement to further reduce their nuclear weapon stockpiles.” The president hopes to sign these breakthrough agreements as early as this year. Further, President Obama suggested strengthening economic ties as part of a new advisory mechanism under the guidance of the U.S. Vice President and Russian Prime Minister. He also hopes that a secure video communications channel will be established between the two presidents before their meeting on the fringes of the G8 summit in Northern Ireland. Of all the U.S. initiatives, it is missile defense that tops Russia’s agenda. A source in the Department of State said that the legally binding agreement on transparency is a so-called executive agreement, which President Obama can sign without asking for the consent of Congress. The only disadvantage of such an agreements is that it's only binding for the administration that signs it. Russia’s attitude to the possibility of such an accord changed quite rapidly. Before Donilon came to Moscow, Russian Foreign Minister, Sergey Lavrov, said there would be no chance that Moscow and Washington would sign the deal. After the visit, the attitude became somewhat milder, albeit skeptical. Russian Presidential Aide, Yury Ushakov, said then that there had been "no progress made in missile defense," and Deputy Foreign Minister, Sergei Ryabkov, complained that there was "not enough political will" in Washington. But now a Russian diplomatic source says that Russia "may well accept Obama’s proposal," because "additional transparency in missile defense is helpful, as it is and as a confidence-building instrument." The source mentioned a major defect in Obama’s proposal, though: If Moscow believes that the technical characteristics of the U.S. missile defense that it receives as part of the agreement may pose a threat to its deterrence forces, it will not be able to make any changes, because the deal only covers the exchange of information. Therefore, the source said that Russia will keep insisting on long-term legally binding guarantees of transparency and that the U.S. defenses are not aimed at Russian nuclear forces. In any case, Moscow and Washington seem ready to break the negative trend in bilateral relations. There are a considerable number of agreements prepared in anticipation of the June talks between the two presidents during the G8 Summit in Northern Ireland and, most importantly, ahead of the personal meeting scheduled for September. 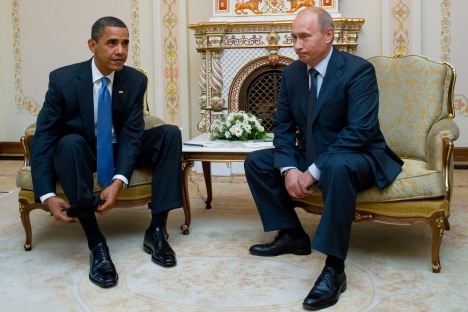 The Kremlin had invited President Obama to make a separate visit to Russia this year. However, the White House decided that Obama would only go to St. Petersburg to attend the G20 summit this winter and have a personal meeting with Putin there. Russia and the United States can meet halfway, though – Obama could come to Russia two days ahead of the summit and visit Moscow first. The two heads of state would thus have a full-scale bilateral summit.